The April/May issue of SA Angler magazine highlights the annual run of southern bluefin tuna through state waters. 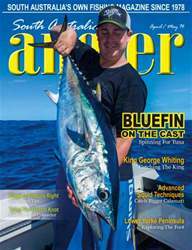 There’s plenty of tuna action, including a great feature by Jamie Crawford on catching bluefin by casting lures rather than traditional trolling. Steve Hunt delves into the wonderful world of King George whiting, Lubin Pfeiffer looks at the brilliant trout fishery at Lake Toolondo and Chris Pucknell provides hints and tips for hooking salmon in shallow water. We test two great boats, as well as several new pieces of fishing equipment, and provide step-by-step instruction on rigging soft plastic lures. There’s something for every angler in our April/May issue.